$595 for the pair. 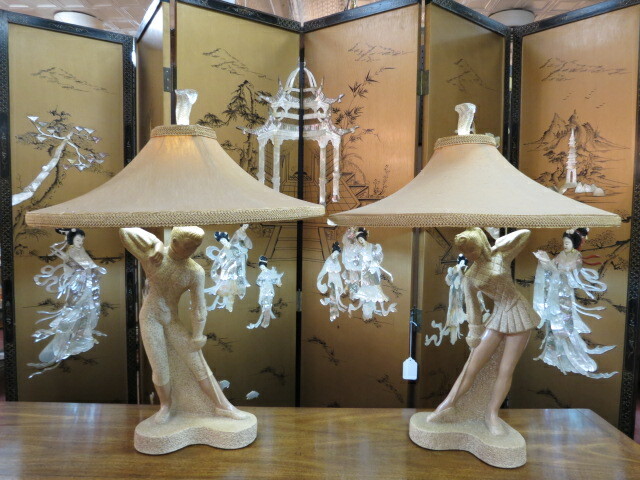 Vintage mid century modern pair of figural Reglor of California lamps, c. 1950. Beautiful plaster lamps of a male and female fencer. Made with a beige sand like texture except for the face and legs. Original cone shaped beige silk like shade and plaster finial. Made by Reglor of California. Reglor was established in 1947, and frequently produced lamps as a male and female pair. Production of Reglor lamps stopped in 1975 when the Reglor factory burned down. Perfect for your living room or bedroom. Excellent condition. Base measures 10in wide, 7in deep; shade measures 25.5in wide. 31in tall.